Active experiments and reflective “incubation” are required for effective innovation. 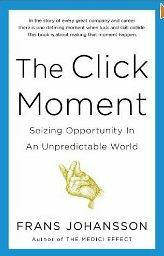 Frans Johansson argues that most success “comes from things we cannot predict and plan: serendipitous moments, unexpected and spontaneous approaches, unusual combinations, and lucky breaks,” in the form of “click moments”, which can move people and ideas to a new, unexpected direction” in in Click: Seizing Opportunity in an Unpredictable World. Many of these recommendations are more similar to behaviors intended to increase creativity and innovation than to quantitative finesse maneuvers. 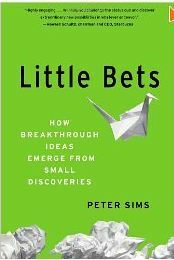 For example Johansson’s recommendation to engage in “purposeful bets” draws from Peter Sims’ recommendations to place Little Bets: How Breakthrough Ideas Emerge from Small Discoveries, which are low-risk experiments to discover, develop, and test an idea. Iterate by frequently testing, refining and improving-*How do you detect and optimize opportunities? -*How do you manage uncertainty in your career? This entry was posted in Career Development, Innovation, Leadership and tagged Career Development, Eddie Obeng, Frans Johansson, Innovation, Leadership, Leonard Mlodinow, Nate Silver, Peter Sims on October 23, 2012 by kathrynwelds.